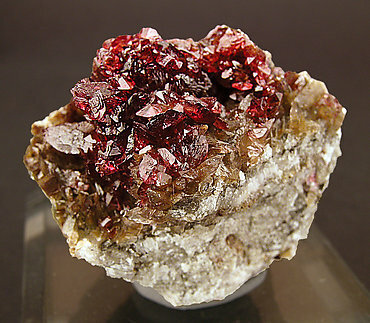 Isolated crystals of magnesian Roselite. 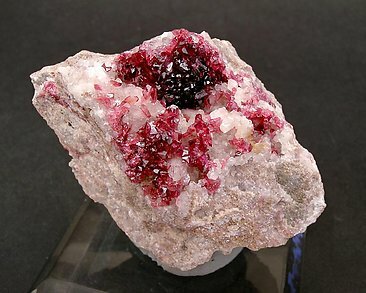 They are very well defined, a lot of them doubly terminated, translucent, have a very intense, deep and uniform color that strongly contrasts with the snow white Calcite matrix. The sample has been analyzed and we will send a copy of the analysis to the buyer. Isolated crystals of magnesian Roselite, some of them doubly terminated. 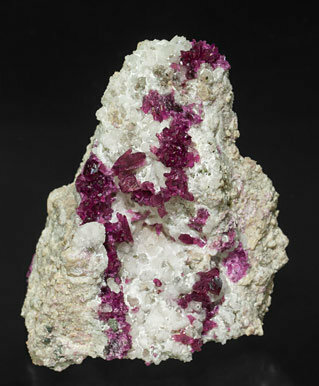 They are translucent, very well defined, have a very intense, deep and uniform color and are on matrix, with Dolomite. The sample has been analyzed and we will send a copy of the analysis to the buyer. 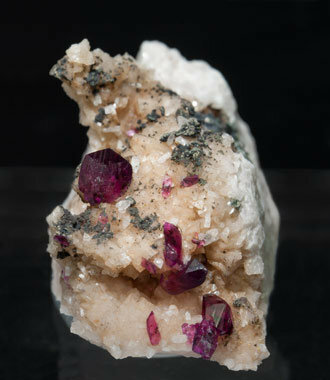 Isolated crystals of magnesian Roselite, one of them clearly dominant, translucent with a lenticular shape and a very intense, deep and uniform color and are on matrix with Dolomite, Calcite, dark spheroidal aggregates of cuprian Cobaltaustinite and small isolated crystals of Cobaltlotharmeyerite. 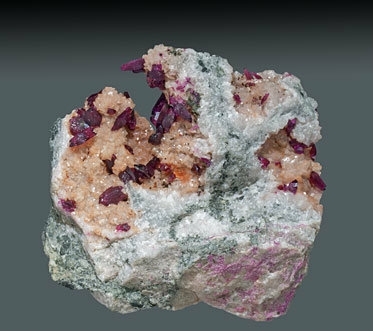 The magnesian Roselite, the cuprian Cobaltaustinite and the Cobaltlotharmeyerite have been analyzed and we will send a copy of the analyses to the buyer. 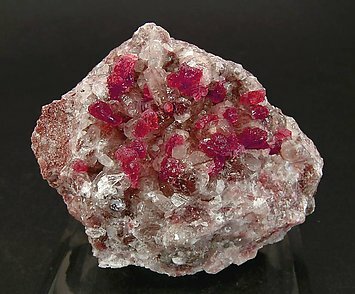 Isolated crystals of magnesian Roselite. 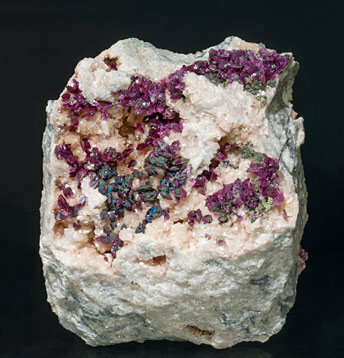 They are very well defined, translucent, have a very intense, deep and uniform color and are on matrix with Dolomite, Calcite, dark spheroidal aggregates of cuprian Cobaltaustinite and small isolated crystals of Cobaltlotharmeyerite. 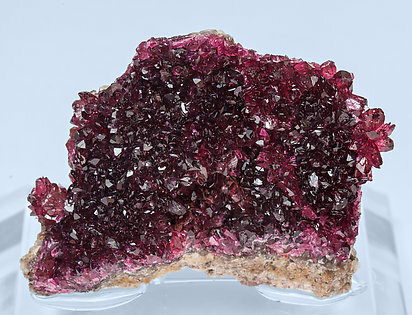 The magnesian Roselite, the cuprian Cobaltaustinite and the Cobaltlotharmeyerite have been analyzed and we will send a copy of the analyses to the buyer. Group on matrix of curved crystals with very well defined faces and edges and with a very deep and intense extraordinarily bright color. 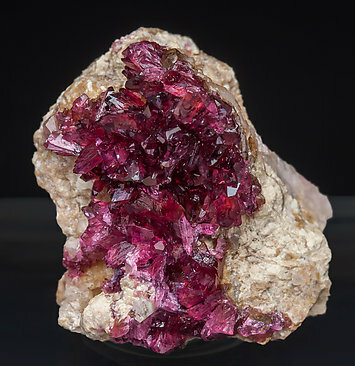 Druse, on matrix, of sharp lenticular Roselite crystals that are translucent, very bright with a deep, vivid and uniform color and they are on matrix. 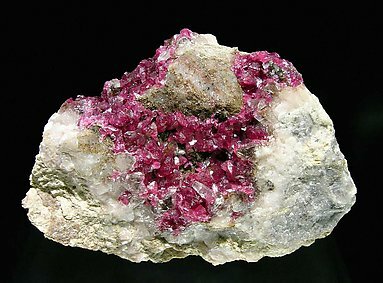 There is matrix and a group of Calcite crystals on which there are pleasingly pink-red crystals of Roselite that have complex forms, which give them a striated look. 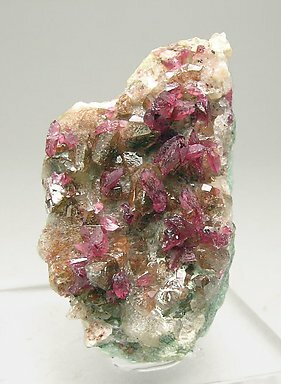 Very well defined and isolated crystals of good color and transparency, with Calcite and on matrix. Groups of crystals that have excellent color and luster. They are with small crystals of Calcite and a crystal of Quartz. On the original label a note says it was acquired November 8, 1969, by H. Sleiffer, from the Netherlands at the Zurich show. A nice miniature in which coexist the two typical habits of the Roselites from Bou Azzer. On the upper part a dense druse with very intense color and on the front part are a lot of individuals on Calcite, some of them doubly terminated and showing their transparency.